Inattention. Hyperactivity. Impulsivity. While these are common behaviors among children, for kids with attention deficit hyperactivity disorder (ADHD), these behaviors interfere with daily life. They contribute to poor school performance, trouble making and keeping friends, and difficulty completing simple home tasks, such as getting dressed or putting away clothes and toys. Until the mid-1990s, there was really only one medication for the treatment of ADHD. Ritalin helped some patients manage their symptoms. For those not helped by the drug, there were few options to calm the fidgeting, lack of focus and emotional outbursts that children with ADHD often experience. Today, there are more than a dozen pharmaceutical treatment options available, allowing doctors and patients to find the right fit for each person. Dr. Richard Short, a pediatrician affiliated with Sharp Grossmont Hospital, counsels a two-track approach to treating ADHD. “Cognitive behavioral therapy, or counseling, is helpful, especially in combination with medication,” Dr. Short says. “There are stimulant medications and non-stimulants. The stimulants usually work better, but side effects can occur.” Side effects can include appetite suppression, stomach pain or drowsiness. “But for many children, the benefits outweigh any side effects,” he says. 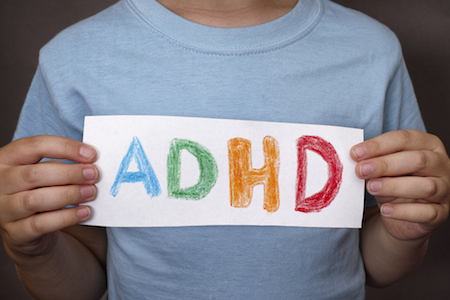 Roughly half of children with ADHD outgrow the need for medication, says Dr. Short, by developing the skills they need to manage it and prevent it from disrupting school or work, home life and relationships. However, the impulsivity and behavior control problems associated with ADHD can worsen during adolescence, requiring cooperation among parents, teachers and pediatricians to help teens navigate the emotional and intellectual challenges of high school. Dr. Short notes that some children thought to have ADHD may have other mental health conditions such as depression, anxiety, bipolar disorder or autism spectrum disorder. He encourages parents who are concerned that their child’s ADHD symptoms are worsening to talk with their child’s doctor about whether behavior therapy can help address underlying or coexisting conditions. Whether or not they are on medication for ADHD, Dr. Short encourages his patients to eat a healthy diet, get at least an hour of exercise each day, stick to a sleep schedule and avoid excessive screen time. Emerging research on the use of mindfulness meditation in the treatment of ADHD also shows promise, he says. Helping kids with anxiety or impulse control issues learn to become aware of their body and breath can train the brain to pause and make a conscious choice of how to behave or react. Information provided by the San Diego Sharp Health News Team. For more health stories visit www.sharp.com/news.